When you feel it is time to update or modernize your bathroom, the relatively small size, compared to other rooms, may have you think it will be an easier job. However, this smaller area will expose poor workmanship worse than any other area of the home. The plumbing, lighting and various other features need to all be done professionally, or you may regret doing the work yourself or by hiring the cheapest contractor. Hidden water damage may be the result of a leaky shower or running toilet. Hiring a professional will most likely ensure that these problems will be remedied. The bathroom remodel needs to be done correctly to limit future problems. This blog written by Michael Ullrich of the Pagenstecher Group details why performing the work yourself has its disadvantages over using a quality contractor. It ties into bathroom renovations because it is probably the top area to not cut corners, but none of your home’s areas should be sacrificed to poor workmanship. If you are like many people, you might enjoy watching all of the home improvement and home renovation shows that are on television today. Plus, you might check out sites like Pinterest and see all sorts of DIY ideas that you are supposed to be able to pull off yourself, even if you do not have any experience. When you combine all of these things and the fact that doing your own renovations is a way of saving money, it might seem like a great idea to tackle your home remodeling project all by yourself. However, even though it might not be a bad idea to tackle some minor things on your own — such as a bit of painting around the house — it really is better to hire a home remodeling contractor for most remodeling jobs. These are some of the many reasons why. First of all, you should consider how dangerous tackling some of your own DIY projects can be. For example, unless you have the experience and the right equipment, it generally isn’t a good idea to crawl on top of your house to do your own roofing work. Additionally, if you don’t know what you are doing, you could be seriously injured or even killed from trying to do your own electrical work. Plus, you have to worry about the potential dangers that go beyond the day that you do the work. If you do too much structural work and don’t do it properly, for example, you have to worry about potential cave-ins and other problems. All of these things can pose serious safety threats for you and your family! Believe it or not, remodeling your own home can be a lot more expensive. For example, someone who is not experienced might waste materials, leading to an additional cost. If the job is not done correctly, the renovation might not last nearly as long, so in the long run, you may spend more having to have it redone. The truth is that professionals generally know what they are doing. You might not be able to get the same results from your own DIY job as you would get if you counted on a pro. If you are going to spend the money to fix up your home, it’s worth it to do what you can to make sure that the job turns out properly. After all, few things can be quite as disappointing as putting a lot of time and money into renovating your home, only to find that you aren’t happy with the results at all. There is less of a chance of this happening if you hire a team of professionals, particularly if you hire the right remodeling company. For example, here at Pagenstecher Group, you can always count on us to do a good job. For certain types of jobs, you might be required to have a permit. In some cases, it is necessary to have a professional handling the job in order to get this permit. If you want to avoid problems with getting the necessary permits and if you want to avoid the fees, fines and other issues that go along with doing home renovations without the right permits, it’s best to hire pros instead. As you can see, doing your own home remodeling isn’t always a good idea. Instead, it’s generally better to hire a team of professionals. If you would like to find out more, contact us so that we can talk about your project. As the baby boomer generation continues to age, more homeowners are demanding universally accessible home designs. Older homeowners are looking for a way to remodel their living spaces to create handicap-friendly rooms, without sacrificing visual appeal or style. As a result, more design and build contractors are getting requests for open floor plans, wider doorways, and other accessible features. The bathroom is often the first place handicapped homeowners look to renovate. According to the National Association of Home Builders, bathroom remodeling is the most requested remodeling job, accounting for about 78% of contractor requests. This may be due to the high ROI that comes with bathroom remodels, which is about 63.6% on average. Here are a few ideas on how to upgrade your bathroom into a stylish, universally accessible paradise. A universal bathroom needs a lot of space in order to make it accessible to those with disabilities. In order to allow proper maneuvering, try to provide a free area of about 5 feet in diameter, and make sure there is about 4 feet of space in front of each bathroom fixture. Tall, narrow doors can make it difficult for those who are in a wheelchair to get through, and should be widened to about 3 feet to allow access. Getting in and out of a traditional bathtub can be very difficult for those who suffer from a disability. However, bathtub and shower grab bars can help eliminate this issue and offer an added layer of independence for those confined to a wheelchair or who use a walker. Roll-in showers, which eliminate the need for a curb, are also an option for those who are disabled. Many disabled persons have difficulty lifting themselves out of their chairs to use the bathroom. Installing a grab bar on either side can usually solve this. In addition, many universally accessible bathrooms are equipped with taller toilets, which make it easier for a disabled individual to get back in their wheelchair once they are finished. Avoid sinks that have cabinets under them, which can impede the reach of a handicapped person. Instead, purchase stand-alone cabinets that can be placed next to the sink. To make sure the plumbing is not exposed, cover any sharp edges or water pipes with insulation. Aside from a home kitchen remodeling job, a Maryland bathroom remodel is the next most significant renovation any homeowner can make to their home investment. So, if you have a bathroom that needs a total makeover, requires major structural repairs, or you are simply interested in adding equity to your home, perhaps it’s time to update and upgrade your home’s bathroom. 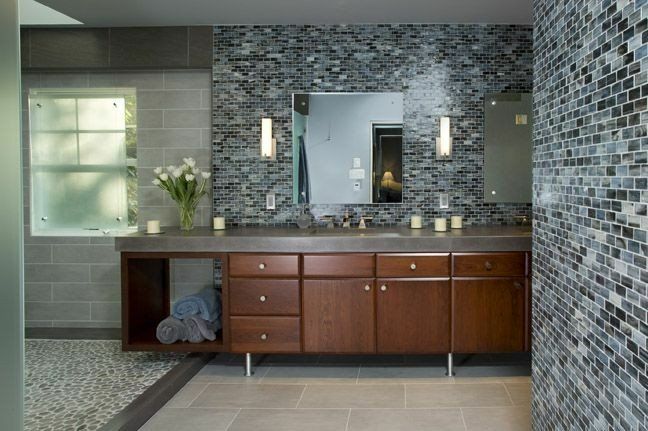 In this post, we’ll provide you with eight reasons for remodeling your bathroom. Continue reading to learn why a new bathroom is just what your home and family need. 1. You want to add money to your home. Without a doubt, a bathroom remodels will add value to your home. Additional equity increases your home’s value, allowing for a more lucrative refinance, and enabling an easier home sale when the time comes. Plus, for those interested in finance, a bathroom remodel’s return on investment (ROI) makes the decision worthwhile. 2. Due to your age or physical needs, your situation requires more safety and functionality. As people age, their needs change dramatically. The same is true for those whose life changed without notice. In either instance, a renovated bathroom more ideally suits living and bathing needs. Features like low curb showers and easier to use toilets are just a few of the new characteristics that make your bathroom safer. 3. You would like a bigger bathroom. Perhaps you bought your home because you loved its location or size. Maybe you thought that the bathroom could use some work. Now’s the time to take that leap. Work with a qualified bathroom remodeler to find out how a larger bathroom benefits you. 4. You have structural or mold issues. Older homes that have never been renovated suffer greatly from mold and structure issues. When these types of problems go unchecked, they can spread like a disease to other parts of the home. A renovated bathroom removes any worry connected to mold or general structural problems. 5. Your bathroom is old and outdated. Much like bathrooms with building material and mold issues, an old and outdated bathroom lacks function and usability. People sometimes live with an unusable bathroom for years because they are “good enough.” This year, we recommend looking into how a new bathroom will increase your quality of life. 6. You would like to add features. Perhaps you need a new double vanity to satisfy a growing family. Maybe you would like to add a stand-up shower for convenience. No matter your rationale, new bathroom features and additions can change a boring bathroom into something fantastic. 7. Your family is growing, so you need a second bathroom. Maybe your expanding family is changing your home’s dynamics. In that case, perhaps it’s time to add that master bathroom that you’ve always wanted. Accommodate your evolving life by working with a certified home remodeler today. 8. You have ever-growing plumbing problems. Problems related to plumbing are frustrating at best. At worst, they can reduce your home’s inner support beams, trusses, drywall, and electrical work to rubble. If you have known plumbing problems and have worked hard to remedy them, sometimes the only solution is to renovate entirely. A home doesn’t work without a bathroom. The bathroom provides us with a refuse for necessity and relaxation. So why not consider giving back and working to turn your bathroom into the experience that you deserve. So, if you have tolerated just about enough of your old bathroom, desire something brand new and shiny, need repairs, or want to add a half-bath to a separate part of your home, don’t delay. The bathroom is almost always considered to be the first or second room to remodel and update in a home. Guests to a home could always use a better bathroom. Your family deserves a better bathroom as well. Can you name one other room in your home where family members literally stand in line to obtain access?